High-quality conditioner type gainer characterized by a significant content of balanced protein and carbohydrates facilitate the balancing of the diet of any athlete! Superb conditioner type gainer increasing muscle mass, used in bodybuilding and fitness. High-calorie supplements to increase the weight supply the body with unnecessary calories and almost cause an increase in body fat. For strength athletes and bodybuilders - the most important goal is to increase lean muscle mass. The protein supplements. Scitec MASS formula 20 is low in fat, high in protein. The protein content contributes to the maintenance and growth of muscle mass and to maintain the proper condition of bone *. The product also provides a "boost" carbohydrates (energy), in which high-intensity exercise is partially based. 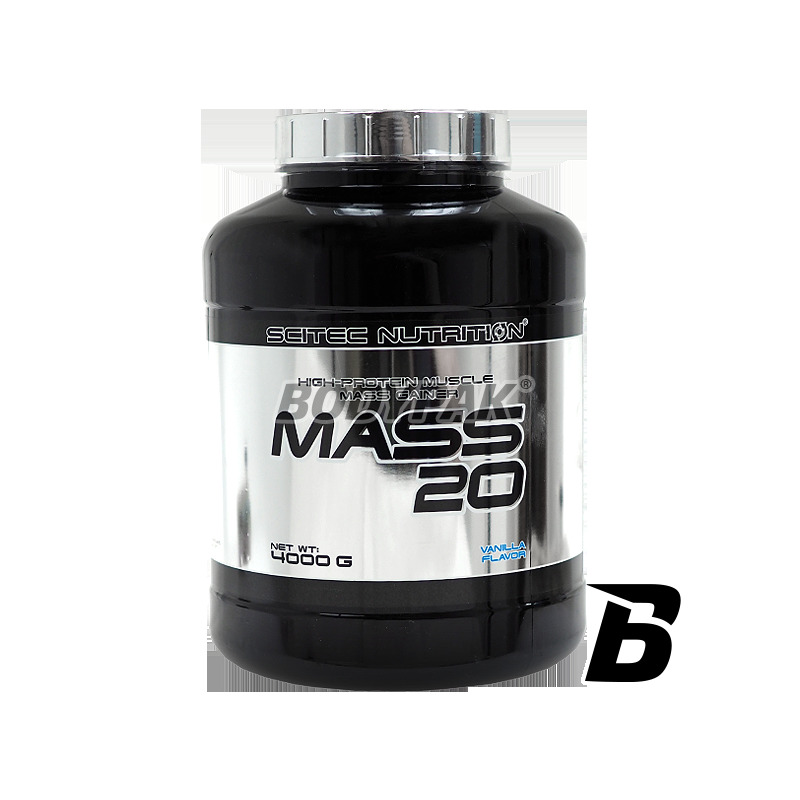 Scitec MASS 20 contains whey protein, one of the best types of proteins in bodybuilding. Our ultrafiltrated whey protein concentrates contain: lactoglobulin, lactoferrin, lactoglobulin and the micro lactalbumin and immunoglobulin. Protein, milk whey protein is considered "complete", since it provides all of the essential amino acids including the nine amino acids essential for life, which the body can not wytwarzać- syneteyzwoać (Histidine, Isoleucine, Leucine, Lysine, Methionine, Phenylalanine, Threonine, Tryptophan, valine). The term "efficacy" nutritional protein content of the diet is largely based on an estimate of the extent to which the protein contained in the nitrogen is absorbed and retained by the body, and that is able to compensate for the daily loss of nitrogen. The net protein utilization (NPU) of the percentage of nitrogen that is absorbed by the body, while the biological value (BV) is the percentage of the absorbed nitrogen, which has been 'stuck' in the body. Thus, BV is the product of NPU and digestion. Scitec MASS 20 - Professional support in the pursuit of desired weight! Dobrze sie rozpuszcza, smakuje i przede wszystkim w 100% spełnia swoją role - polecam, szczególnie wanilie jeśli chodzi o smak.